You are currently browsing the tag archive for the ‘disk utility’ tag. In a follow up to my post about how to dual boot Tiger and Leopard on your Mac, this post is about removing large (unnecessary) files from your hard disk and recovering disk space on your hard drive before attempting to repartition Macintosh drives and dual booting. Many folks have been noticing that repartitioning disks using Leopard Disk Utility often fails with an error of “no space left on device”, even though there is plenty of space “left on the device”. A solution that many have found is removing any “large” files from your Tiger partition before attempting Leopard Disk Utility repartitioning. By large files I’m talking single files that are in the range of 1GB+. Before running off and deleting large files on your hard disk willy nilly, please, make a backup of your Mac hard drive using SuperDuper! (free / donation-ware) or move these large files off to a secondary external hard disk connected via USB or FireWire. If you find that you actually need these files later, you can always move them back or revert to your complete backup you made to an external drive. A great program that helps with finding and moving / removing large files on your disk is Disk Inventory X. Disk Inventory X generates a visual file map of your disk like the one displayed here. Click on the large squares and rectangles to inspect the details of the files. The usual suspects that you can get rid of safely include scratch disks such as the Photoshop scratch disk and the Apple safe sleep memory image. This safe sleep / hibernate memory file takes the contents of your physical RAM and copies it to disk (in a single file) so that your Mac can “hibernate” for an indefinite period, with or without power, without losing what you were working on. 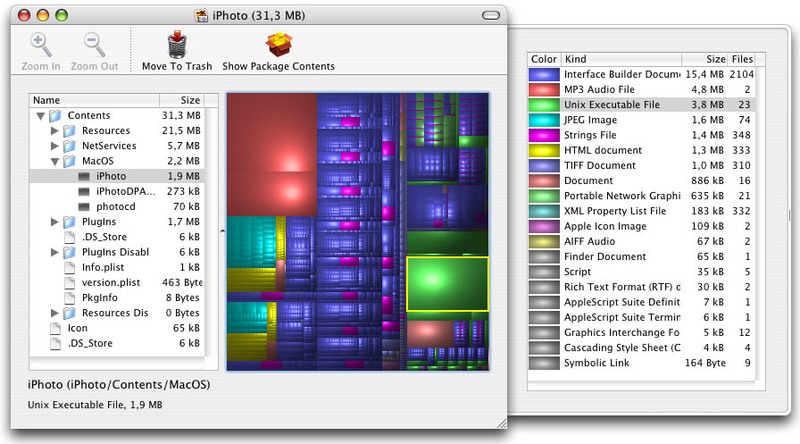 The downside of this is that it creates a file equal the size of your physical memory. That can be anywhere from 1GB to 4GB for Macbook users. That should return you something like “hibernatemode 3”. Remember this number, send an email to yourself, write it down on a scratch pad, whatever it takes to remember your default mode. Mode 3 keeps your RAM powered during sleep to allow super fast wake-up, but also writes an image file of all memory onto disk in case power is lost. Macworld has a great article with more information about safe sleep and hibernation on portable Macs. The best solution to the “no space left on device” errors while partitioning your Mac hard disk is to continue with finding and deleting 1GB+ files that you can live without or can move off to a temporary external disk. Then get back to repartitioning your Mac hard disk in preparation to setup a dual boot of OS X Tiger and Leopard on your Macbook. The following is a summary of how I created a dual boot setup of OS X Leopard (10.5) and Tiger (10.4) on a MacBook Pro, keeping the original Tiger installation intact and available through alt/option booting during system startup. Always Always Always make a backup before you try any shenanigans like I do below. The best way to do this is with an external drive connected to your machine via FireWire or USB 2.0 and using cloning software such as SuperDuper! Boot from the Leopard install dvd to allow repartitioning your Tiger-installed hard disk without erasing the disk first. Insert the Leopard install DVD into the dvd drive. Ignore the pop-up Finder window. Shut down your Apple computer (don’t use restart). After your Apple has shut down fully, press the power button to start it. When you hear the power-on “chime”, press and HOLD the Option button (just left of the Apple/Command key, also known as Alt or two horizontal lines, one diverging before connecting with the other). If for some reason your Mac doesn’t make a noise when you boot up, just press and hold the Option button when the screen lights up. Hold the Option button down until you see a grey screen with two (or more) options displayed. One of which will be a picture of a hard disk and another of the Leopard OS X Install DVD. You may have more bootable disks to choose from if you have more than one partition on your hard disk.Using the arrow keys, move to the Leopard Install DVD and hit Enter. This will boot into the Leopard install program. DO NOT hit continue when the Leopard install window has loaded.Using the mouse, navigate up to the top menu bar and choose Utilities, then Disk Utility. Once Disk Utility has loaded you should see your Apple computer hard disk, the Leopard install dvd, and possibly other disks if you have them attached to your computer. Choose the hard disk that you want to install Leopard on. By default this should already be selected. For me the Disk is a 111.8 GB Fujitsu MHW2… drive with Macintosh HD underneath it (that’s the volume, within the Macintosh hard disk, you can have multiple volumes inside one hard disk). From here you should see the partition map of your Macintosh HD hard disk, a rectangle standing tall, outlined in blue. Above the right hand side window will be five choice buttons: First Aid, Erase, Partition, RAID, Restore. First Aid:You will want to Repair your Macintosh HD before doing any partition changes, regardless of whether you know it is verified or not already. Paritioning will fail if the disk is not error free and verified within this install session. Verifying the disk within Tiger does not mean that Leopard Disk Utility will consider the drive error free as was the case with my install. Thus, repair the disk once you get to this step, even if you had previously verified the disk in Tiger. After Verify Disk step is completed, we’ll resize the current Macintosh HD Tiger partition and create a second Leopard partition with the free space. NOTE: The resize and creation of a secondary partition will LIKELY FAIL if you have Parallels installed in your Tiger system disk/volume. For the repartitioning to complete without “no space left on device” error, I was forced to delete my Parallels Windows XP SP2 virtual disk, which was roughly 10GB in size. There are some files that Disk Utility Partition program cannot move when performing its resize and repartiton operation. The Parallels virtual disk file is one of these immovable files. When Disk Utility comes across this file, repartitioning failed with the error: “no space left on device”. The solution in my case was to reboot back into Tiger, load up Parallels, and simply delete the virtual Windows XP installation (I skipped deleting the floppy drive) which deletes the virtual disks as well. I chose this because my Windows XP install is already backed up onto an external USB 2 drive clone of my Tiger system created through SuperDuper!. I’m guessing that you can simply move this file off to some secondary external drive, replace it after, and everything will be handy dandy, although I have not tested this. EDIT: Yozlet mentions in the comments below that removing large files (1GB+) can also help avoid the dreaded “no space left on device” error while repartitioning the drive. Here are some tips on finding and removing old files on your Mac to avoid the “no space left on device” error. Click and drag the bottom right hand corner of the Volume Scheme (the blue outlined rectangle which represents your disk, Macintosh HD) and drag it upwards, making the volume smaller. I chose around 30GB for the Macintosh volume, out of the entire 110GB disk. This leaves a healthy chunk (80GB) of unused disk space on the drive. Beneath the blue rectangle Volume Scheme there are plus and minus buttons. The plus button when clicked will add a partition to your disk. Click this to add a generic volume onto which we will install Leopard. After clicking the plus button for adding a partition, I again had to adjust the size of the Macintosh HD volume where Tiger resides, back down to about 30GB. After this, click Apply, then Partition on the pop-up window. Go make some coffee while it does the partitioning. After you’re well caffinated partitioning should be finished and you’ve got a pristine empty partition on which to install Leopard.Exit out of Disk Utility and you’ll see the Leopard install screen again. Click Continue from here and you’ll be asked where to install Leopard. Here we choose Leopard on our hard disk. After that, continue with the install as per normal. Near the end of the Leopard install the setup program will ask if you already own a Mac and want to transfer previous settings and applications. For this step choose from another volume on this Mac. Obviously the volume we’ll use is the Tiger volume that we’ve preserved on this computer. After that, I choose User files and settings, Applications and network settings. You can choose what you desire here, but I left it at that. Any programs or settings that didn’t make it over should be easy enough to replace, reinstall after. This step can take the better part of an hour depending on how much data you’re transferring. Best of luck. Keep that backup handy.